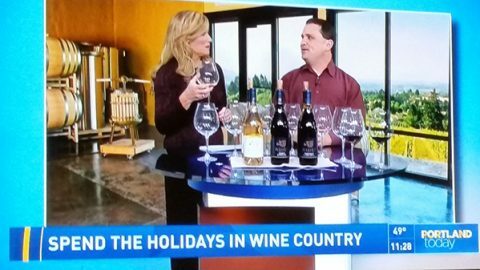 Many thanks to Portland, Oregon-based Wine Blogger Tamara Belgard of the exceedingly popular local wine blog, Sip With Me, for a great interview with David, pasted with permission below. Among other nuggets in the Q-and-A interview, you can find out the first wine Dave ever drank, what wine he served on a disastrous first date (NOT with the CMO and Chief Financier), and what winemaking has to do with Tom Petty. Enjoy. 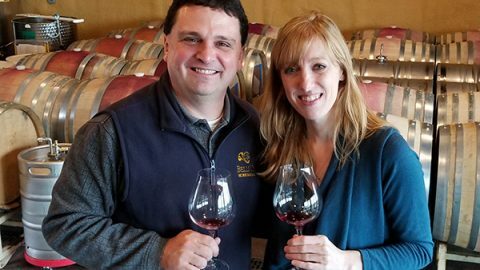 In this on-going interview series, I will introduce you to a different Oregon winemaker in the hopes that as you learn more about them, you’ll also be interested in learning more about their wines. You might discover how and why they came to make wine, you may gain a better understanding of their palate and how it influences the wines they craft, you might get some great new ideas for what and where to eat, what to drink, or you might get a glimpse of the future. Whatever you take away, I hope includes a deeper appreciation for the notion that behind every bottle, behind every brand, behind every decorated or undecorated label, stands a person with a unique vision and a personality all their own. Let’s step back and discover how those characteristics intertwine with and become that memorable wine in your glass. Q. What was the first wine you ever drank? A. My family very rarely drank alcohol – not for any religious or social reasons but it just wasn’t something they did. But when I was like 8 or 9 years old, someone opened a bottle of Manischewitz at a family event. I have no idea why. Anyway, being the curious kid I was I asked to have a sip, with completely predictable results. Q.What was the first wine you ever enjoyed? A. I was cooking dinner for a date and was trying to impress her so I served up a Chateau Ste. Michelle Riesling. The wine experience was better than the date experience! Q. Tell me about your aha wine moment. Either when you realized you wanted to make wine, or when you gained an understanding of the beauty and complexity wine offers. A. I was at EPCOT in Orlando with a good friend of mine from school and we split a nice bottle of Cotes du Rhone at the restaurant in the French pavilion. Between interplay of the wine and the food, I started to realize that amazing things were possible and began learning whatever I could. Q. What’s your favorite part about being a winemaker? A. I can’t pick just one. I love to craft a wine – to me it’s like composing a symphony where you’re bringing together individual instruments and voices to create something larger than the sum of its component parts. I also love sharing my passion with others, whether they be wine geeks or just folks out for a nice afternoon. My fondest memories of visiting wineries have always been based on the people I encountered, and my vision for our winery is to be a place where our customers can have that kind of experience. Q. What’s your harvest kickoff soundtrack? A. Interesting question. Before I started in the industry, I saw harvest as this dramatic event and I was absolutely sure that the theme music would be something similarly dramatic – like Strauss’ “Also Sprach Zarathustra” (many know it as the theme to the movie 2001) or Copland’s “Fanfare for the Common Man.” But now that I’m spending more time in the vineyard, I see harvest as just another step in the journey from grapes to wine and chose something much more low key – Tom Petty’s “Learning to Fly.” There’s a line in that song I always think about that is so perfect for winemaking – “So I’ve started out for God knows where / I guess I’ll know when I get there.” At harvest, we don’t know exactly what wines will emerge from the process to come but we can’t wait to make the journey. Q. What is your favorite food and wine pairing? A. I don’t like to stress out about food and wine pairings – I think most wines can be paired with more foods than traditional “rules” allow for. So my favorite pairing is simple – pizza and chianti were made for each other. Q. You’re celebrating the end of a busy week, what’s your go-to drink? A. Depends on whether we’re talking good busy or bad busy. Good busy leads to seasonally appropriate wine. Bad busy leads to bourbon. Q. Right now do you have a full fridge or empty fridge? I have a moderately full fridge but my freezer is stuffed to the gills. With a 5-year-old and a busy schedule, I can’t cook fresh as much as I’d like so when we do find time to cook we tend to make a lot and freeze the overage. At least then we can pull out quality leftovers whenever we need. Q. Is there a wine you hate to love? A. Oh goodness no. Wine is a world full of possibilities so why would we feel bad about discovering something wonderful? Q. 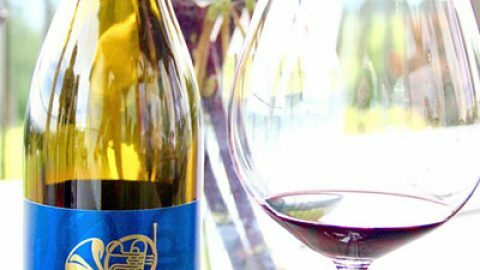 Is there a wine you love to hate? A. Heavily oaked chardonnay. A TOUCH of wood is okay, but leave the heavy toast barrels out of the rotation, please. Q. What’s your guilty pleasure? One you’re willing to admit anyway. A. Thick, chewy chocolate chip cookies. Preferably with semi-sweet chocolate chunks. Believe it or not, Costco’s store-brand cookies are tremendous. Nothing else should go into the cookie – save your nuts, grains, and raisins for something else and away from my cookies! Q. Winemakers sometimes seem like they’re married to their job. How do you find balance in your life? A. Be as efficient as you can with your time management. Make things as simple as possible, prioritize your tasks well and, most importantly, demand from yourself that personal/family time is as much a priority as everything else in your life. Keep your expectations of yourself realistic. None of us are superhuman and nobody can do everything. Trying to micromanage or stretch yourself too much in this business for any length of time is only going to burn you out and hurt the quality of your product and brand. So find good people to work with, delegate as much as you can, and trust them to do the job. Q. What are you working on right now that most excites you? A. Our inaugural vintage (2013) pinot noir and syrah to be released in 2015. They’re coming along great in the barrel and I’m really excited to see how they are at bottling! Q. Favorite wine – variety, region or brand. A. I wouldn’t be here if I didn’t love Oregon pinot noir above all else but my heart will always be loyal to seyval blanc. It’s a white grape I worked with when I lived in Ohio and you’ll see it throughout the Midwest and northeast. It’s a hybrid, meaning that it has both vinifera and non-vinifera parentage. It’s extremely flexible in that you can steel ferment (which I prefer) or barrel ferment, with distinct but amazing results. It has a citrus flavor profile, a nice clean minerality, and no trace of the foxy characteristics you often find in hybrids. My first winemaking medals came with this wine, and I’m installing a block of it in our estate vineyard in 2015. I can’t wait to share it with the Willamette Valley. A. Haven’t been in the area long enough to endorse a favorite – way too many to choose from! 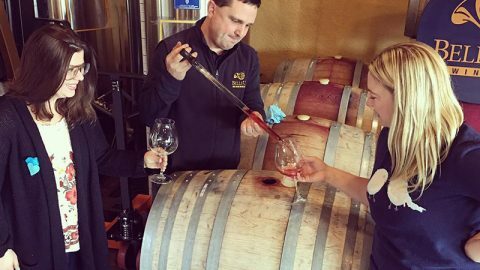 David Specter of Bells Up Winery is a relative newcomer to the Oregon wine scene. 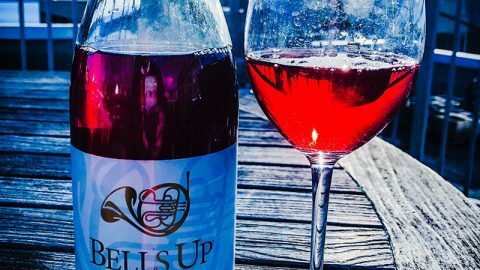 Founded in 2013, Bells Up Winery, located in Newberg Oregon, is scheduled to release the first of their wines in the Spring of 2015. The name Bells Up is a reference to a dramatic moment in classical music where the composure instructs French horn players to lift the bells of their instruments upward and project their sound with maximum intensity. 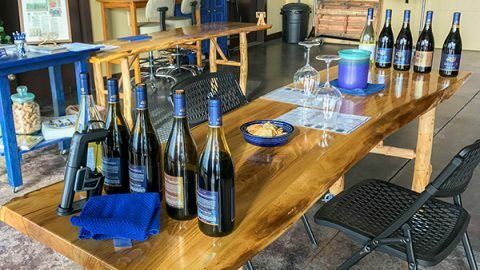 Specter, a French horn player who played in bands and symphonic groups throughout hight school and college feels the winery is his “Bells Up” moment. Bells Up planted their estate vineyard in Spring 2014 and has been working hard building their estate winery and tasting facility. Keep your eyes peeled for good things to come.